Select a size 3-6 yo 7-11 yo teen Sm. Ladies 7 " Med. Ladies 7.5" Lg. Ladies 7.75" XL Ladies 8" Mens 8.25"
Memorial bracelet for your furry, four-legged, best friend. It can be hard when your pet crosses over the rainbow bridge. Remember them fondly with this personalized charm bracelet. Each comes with a cute little paw print charm that says "best friend". Made on durable stretch cord. Sized by age. See Order info below. ORDER INFO - For faster processing of you order please include the following information in the "notes to seller" at checkout. Bought it for my employee as a gift for her cat and she loved it! My daughter loves it! She misses our cat Daisy very much, and she cried when I gave this to her. Thank you!! Lovely item...gave 4 of these for a gift after the loss of a pet. The recipients loved the bracelets so much. Thank you, and special appreciation for making these and sending them out within a couple of days. Many thanks!!! 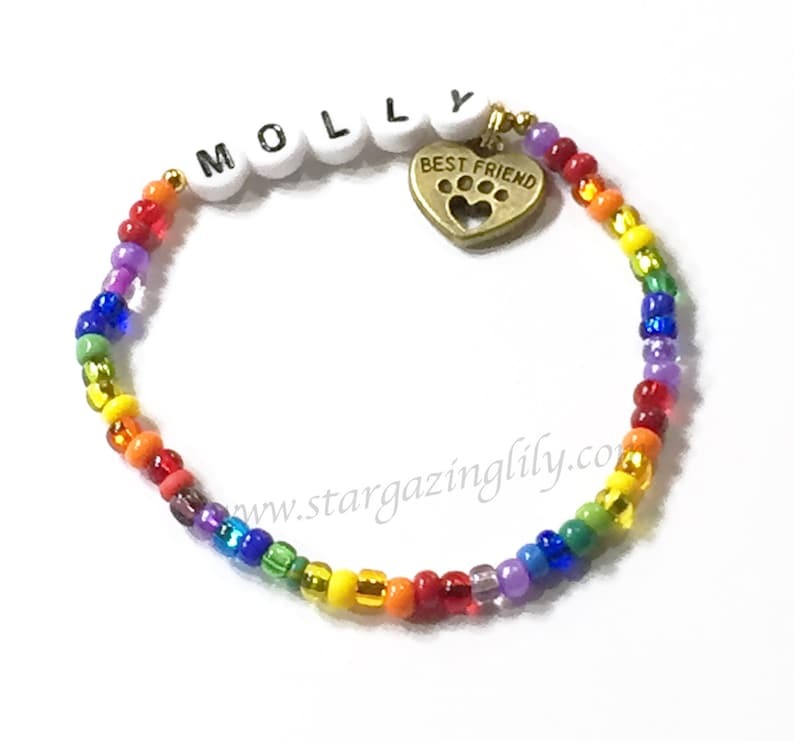 Personalized name bracelet. Princess Name bracelet for your little girl. Rhinestone heart charm YOU CHOOSE COLOR. You choose Charm.